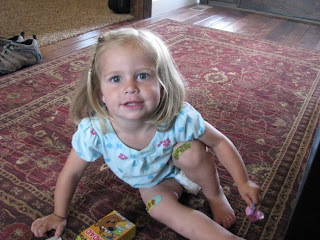 Zoey is obsessed with bandaids right now and if she can find a box of them she will put them all on. There are no scratches on her legs, they are just for decoration. Is Zoey obsessed with pooping in Tiff's upstairs too? j/k we love that stinky kid!!! 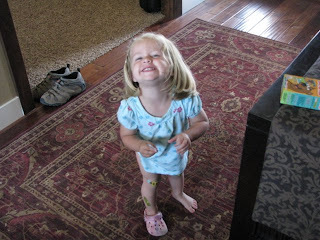 Cute decorated legs, Zoe!! Sof is up to the same stuff. 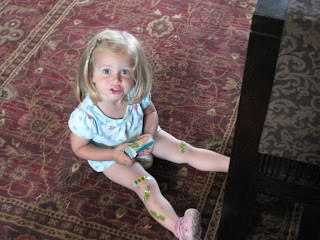 I think we have gone through 14 boxes of band-aids this year and have had about 14 scratches!!! Zoey is so dang cute. Zoey looks so much like you in those pics. What a funny kid. So Funny! Don't you just love those phases? But seriously- bandaids get so stinkin expensive. What ever keeps then entertained! She just wants her legs to look pretty!...Zoey looks just like you in that middle picture...so cute! She's getting so big! So cute ! My 3 yr old is afraid of band aids. Where have you guys been? We are still eating out every meal maybe you just started cooking or something. We haven't seen you at the fields either. Maybe fall ball.